The North Face® Endurance Challenge presented by GORE-TEX™ Half Marathon recap. jon, greg and i got up way too early on sunday morning to go run around the golden gate national recreation area in very, very, very cold (for california) weather. this race was pretty big for me, as it was the first event since i got doored on my bike and was completely sidelined for 2 months. i felt great starting out, even ran most of the way up the first hill! let’s talk about the hills in this race: there are three hills and they’re pretty freaking big. you’ve done around 2200 ft. of elevation gain after climbing them all and the down slope of the second hill is basically too steep and gravelly to run safely, it’s more of a stutter-step-shuffle-scramble-slide thing all the way down. it was while going up that second hill that i realized there was no shame in taking walk breaks on these tiny mountains, otherwise i’d burn out so fast i’d tack an extra hour on to my finish time. every time you crest one of those horrible hills, you’re rewarded with a new, stunning view of northern california, from the farallons and napa, to oakland and the peninsula. loads of people were stopping to take pictures, you can find some by searching instagram and twitter for #ecschampionship. i surprised myself and finished in 2:19:21, about 10 minutes ahead of what i was hoping for. the race was very well organized, had a good vibe all around and i will definitely sign up (and train WAY harder) for it next year. Motivated to Run, but thats about it. 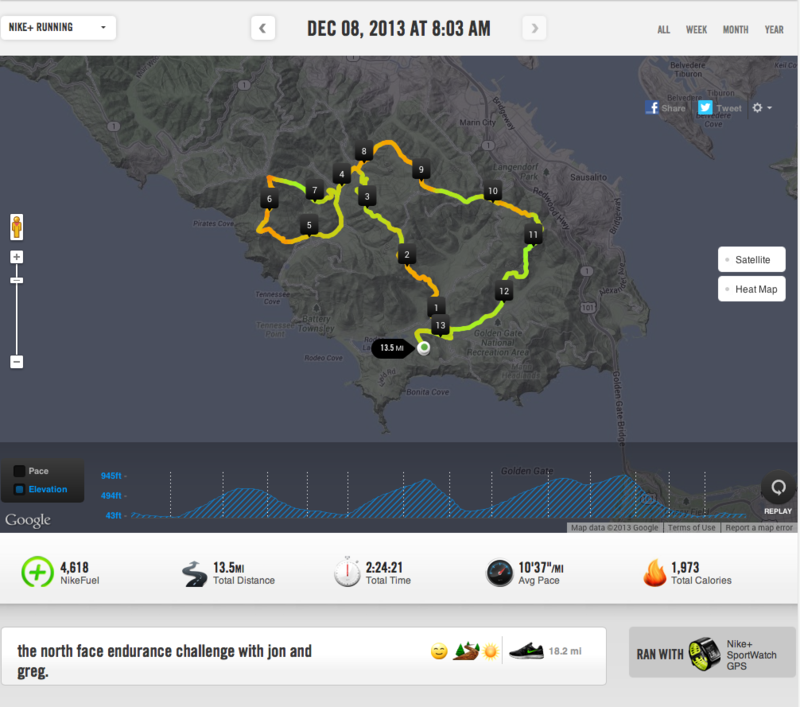 4 Responses to The North Face® Endurance Challenge presented by GORE-TEX™ Half Marathon recap. 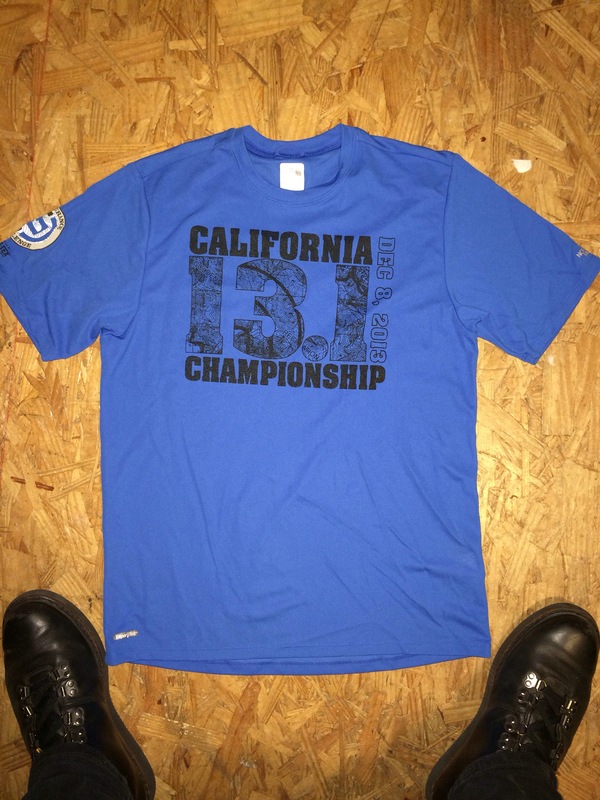 Nice work dudes! I’ve biked those hills and they are indeed no joke! We need to do more trail running… There’s too much awesome stuff near by for us to keep running around the block. out of the three of us, i thought i would be the best trained and would therefore be able to keep up with matt and greg’s natural ability (they’re like deer and i’m a wombat). alas, was not the case. i was just stymied from the get go on those hills. too much flat training here in SD. let it be a lesson to us all to incorporate hills into training!!! Proud of you, babe. I love moments like this in running. You walked through our front door, smiling from your chest out. That’s how I knew it was a good run. Frozen balls and all.